Known for her polka-dotted patterns – a motif that was recently echoed through her collaborative endeavor with Louis Vuitton – Japanese artist Yayoi Kusama was tapped to aid in the creative direction of the latest issue of W Magazine. 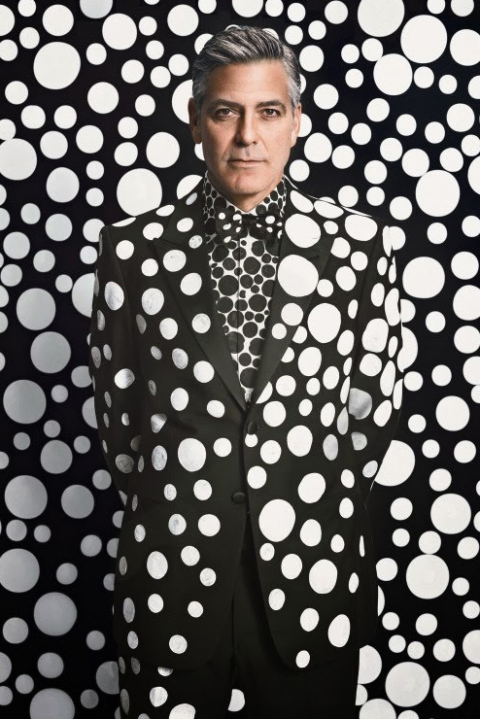 The result is an art-dedicated issue of the fashion mag with none other than George Clooney – decked out in Kusama’s black and white dots – gracing the cover ahead of the release of The Monuments Men. Head on over to the magazine’s website for the full cover story and look for the December 2013/January 2014 issue of W on newsstands soon. This entry was posted in Design, Fashion, Links, Photo, Style and tagged artist, George Clooney, Japan, Japanese, Louis Vuitton, photo, photography, The Monuments Men, w, W Magazine, Yayoi Kusama. Bookmark the permalink. donde puedo conseguir este traje?